This form is used by a buyer’s agent when employed by a prospective buyer as their sole agent, to prepare an offer to render services on behalf of the buyer to locate and acquire property for a fixed period of time. The individual employed by a client to provide real estate services in expectation of a fee is always a licensed real estate broker. Thus, if a dispute arises with a client over the client’s failure to pay the agreed-to fee, it is the broker employed under a written listing signed by the client who pursues collection. A real estate agent employed by the broker may solicit and enter into a listing, but the agent does so acting on behalf of the broker. The agent has no independent right to enter into or enforce a listing agreement naming the agent as the person employed. Essentially, the agent is an agent of the agent — their employing broker. The objective served by most types of listing agreements is the sale or purchase of single family residential (SFR) property. Others are for residential-income and commercial-income properties comprising industrial, retail, office, farm and motel/hotel or unimproved parcels. As with an exclusive right-to-sell listing, the exclusive right-to-buy variation contains provisions stating a broker fee is to be paid by the buyer — unless the seller agrees to pay the fee — when the buyer acquires property of the type described in the buyer’s listing during the term of the listing or safety period. advise the buyer on both the short and long-term advantages and disadvantages of each property presented. Critically, a buyer’s broker locating properties listed by other brokers does not become a dual agent or lose their status as the buyer’s exclusive agent when the buyer’s broker coordinates with a seller’s broker to obtain information on their listings. Also, the seller typically pays the buyer’s broker’s fee — either directly (which is the best practice) or through the seller’s broker. This fee activity does not create a dual agency. A broker who seeks and locates properties at their buyer’s request does so and negotiates the purchase terms as the buyer’s agent regardless of who pays the fee. Again, the seller typically pays the fee from the gross sales proceeds paid by the buyer. As always, all compensation received by a broker and their agents arising out of a transaction involving their client needs to be fully disclosed to the client. Under the Statute of Frauds, signed written documentation of an obligation to ensure the payment of a fee is the legislatively enacted and judicially mandated requisite to collection of a brokerage fee. Written documentation is critical to manage the relationship when working for a buyer. Without the buyer’s written promise to pay a fee, the broker cannot enforce collection when the buyer attempts to bypass them and acquire property of the type sought or on which the broker provided information. the seller intentionally interferes with the performance of the buyer’s oral (or written) promise to pay a fee. The following instructions are for the preparation and use of the Buyer’s Listing Agreement — Exclusive Right to Buy, Lease or Option, first tuesday Form 103. 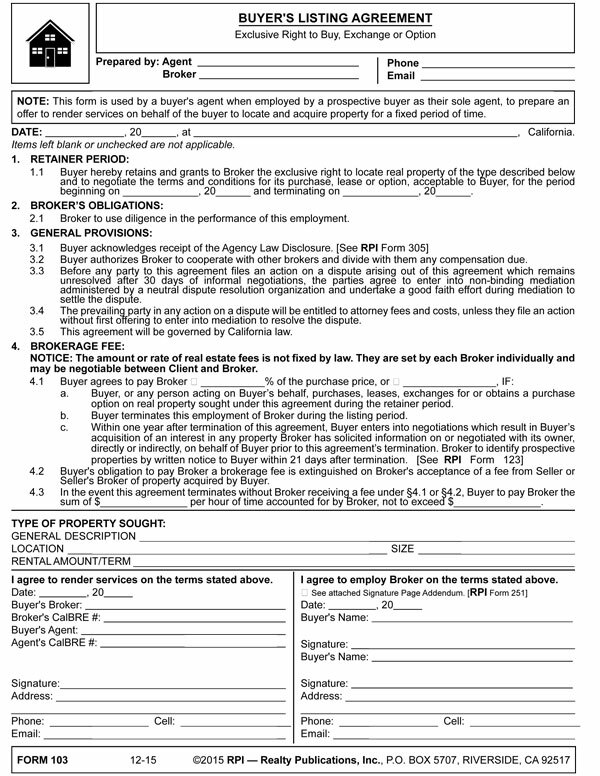 This form is used by a buyer’s agent when entering into the employment of a buyer as their sole agent retained for a fixed period of time, to locate and acquire property. Enter the date and name of the city where the listing is prepared. This date is used when referring to this listing agreement. 2.1 Broker’s/agent’s duty: The broker and their agents promise to use diligence in their effort to locate the property sought by the buyer. The agency duties a broker and their agents owe the buyer are always implied, if not expressed in writing. 3.2 Authority to share fees: Authorizes the broker to cooperate with other brokers and share with them any fee paid on any transaction. 3.4 Attorney fees: Entitles the prevailing party to attorney fees if litigation results from the buyer’s failure to pay fees or the broker’s breach of an agency duty. 3.5 Choice-of-law provision: States California law will apply to any enforcement of this employment. b. Termination fee: States the broker fee is earned and due if, during the listing period, the buyer terminates this employment or withdraws from pursuing the purchase of real estate. 4.2 Fees paid by seller: The buyer will not owe any fees if the seller pays a fee or the seller’s broker shares a fee in an amount acceptable to the broker. If the seller or the seller’s broker do not agree to pay or share a fee with the broker, the buyer is to pay the broker fee in addition to the purchase price. 4.3 Hourly fee: Enter the negotiated dollar amount of the broker’s per hour fee. The hourly fee is earned for time and effort spent on behalf of the buyer if property is not optioned or acquired by purchase or exchange after a diligent effort is made to locate property. Property description: Enter a description of the type of real estate sought by the buyer, including its size, general location, purchase terms, and property requirements. Broker’s/Agent’s signature: Enter the date the listing is signed. Enter the broker’s name and California Bureau of Real Estate (CalBRE) license number. Enter the agent’s name and CalBRE license number. Enter the broker’s (or agent’s) signature. Enter the broker’s address, telephone numbers and email address. Buyer’s signature: If additional buyers are involved, check the box, prepare a Signature Page Addendum form, reference this listing agreement, and enter their names and obtain their signatures until all buyers are individually named and have signed. Enter the date the buyer signs the listing and the buyer’s name. Obtain the buyer’s signature. Enter the buyer’s address, telephone numbers and email address.